One cloud variety that earns high cloud collecting points among photographers and cloud spotters are undulatus clouds. Learn some interesting facts about this cloud formation in the succeeding paragraphs. Read on. Undulatus clouds refer to cloud formations in sheets or patches organized in parallel lines that form wave-like patterns like ripples on the surface of the ocean. It is named after the Latin word unda which means “waves” as this cloud exhibits some undulation. When distinctive columns and rows are visible on the arrangement of cloud elements in a single cloud layer, it is called bi-undulatus. Undulatus clouds occur in any season and announce the incoming weather system. They arise due to the wind shear occurring in the cloud level. At What Height is Undulatus Clouds Found? Undulatus appears in all cloud levels at elevations anywhere between 6,500 feet and 20,000 feet above the Earth’s surface. The wavy clouds occur near the inversion surface, a very stable layer in the atmosphere that prevents clouds from moving upwards. The Undulatus cloud is responsible for a gloomy day and indicates rainfall within the next 20 hours. Although it also signifies wind turbulence at the cloud level, it does not pose any concern for aircrafts because the effect is hardly severe. How do Undulatus Clouds Form? Undulatus forms due to wind shear happening in the stable layer in the atmosphere. The disturbance in the stable atmospheric layer can be due to the abrupt change of wind speed and direction caused by an approaching frontal weather system or a simple atmospheric convection (lifting of warm air due to surface heating) from mountain tops. The disturbance in the cloud layer causes waves of air to move similar to waves in a pond. As winds blow at different speeds in the cloud layer, clouds stack into curving ridges, bond and divide forming wave patterns. Undulatus clouds generally appear in the cloud genera of stratocumulus, altostratus, altocumulus and cirrocumulus, and rarely in the stratus form. Undulatus in this type takes the form of wavy stratocumulus clouds separated by cloud lines. 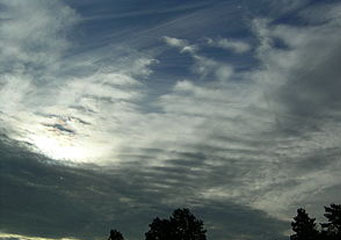 When fibrous altostratus clouds are arranged in undulating pattern, it is in the form altostratus undulatus. It is called altocumulus undulatus when rolls of altocumulus clouds exhibit a wavelike structure in patches or sheets. A well-defined altocumulus undulatus signifies that there is an impending frontal system and may generate precipitation as either rain or snow. This appears as undulating or wavy thin patches or layers of cirrocumulus clouds. How do Undulatus Clouds Look Like? These clouds exhibit a wavy appearance sometimes in patches or layers. More often, undulatus clouds run in single layer parallel lines but they may also appear to interlace across the sky especially under the bi-undulatus wave system. The patches or layers can be white to gray that look like ripples or waves in the water. How common are Undulatus Clouds? Undulatus clouds appear in most parts of the globe but they are very frequent in the mid-latitude regions like in the U.S. In the United States, these clouds are habitually seen on the southern stretch of the country due to the tropical or subtropical weather system outflows traveling north. They may also originate from southwestern monsoon heading west and the Great Plains.